Candy Bar Brownies are delicious and super rich. Chopped candy bars are folded into the batter and into a creamy batter to form an incredibly decadent dessert. 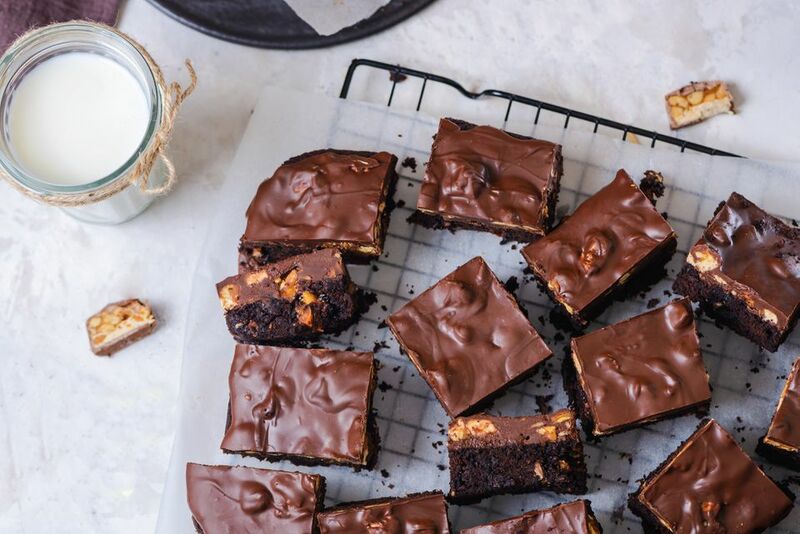 Use any of your favorite candy bars in these luscious brownies. One tip: If you use Snickers or Milky Way, chop them just before you add them to the batter, since they can dry out quickly. These brownies are perfect for a bake sale or for a holiday cookie tray. Serve them with a big glass of milk for a fabulous afterschool treat. Preheat the oven to 350 F. Spray a 13x9-pan with nonstick baking spray containing flour and set aside. In a large bowl, combine both boxes of brownie mix, oil, water, and eggs. Mix with a wooden spoon until blended. Stir in 12-ounce batch of chopped candy bars. Pour the batter into the prepared pan. Bake for 35 to 45 minutes or until brownies are set and crust is shiny. Don't overbake the brownies. In a medium microwave-safe bowl, combine the chocolate chips and peanut butter. Microwave on high for 1 minute, remove, and stir. Continue microwaving for 30 second intervals, stirring after each interval, until mixture is smooth. Stir in the second batch of chopped candy bars and spoon and spread the frosting over the warm brownies. Let the brownies stand on the wire rack until set.